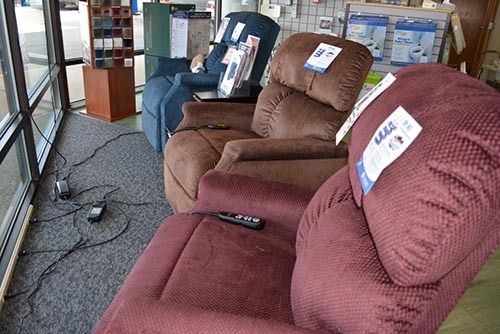 We carry Golden Technologies lift chairs in many styles and sizes to fit most everyone. They come in different fabric colors and types of fabric from cloth to Valor (vinyl) to Brisa (leather). They come in 5 sizes and will fit someone who is under 5' to someone who is 6' 8" tall. They also come in wide width with 2-3 motors holding up to 700 pounds. You can upgrade to get heat and massage, a foot extension, or a head pillow. We also rent the medium chestnit vinyl - great for after surgery.